Download "The High Performance Floormount Indoor Package Cooling Solution. Precision Cooling for Business-Critical Continuity"
2 We re Emerson Network Power, backed by Emerson, a global company that brings technology and engineering together to provide innovative solutions for the benefit of our customers. We re the world leader in providing Business-Critical Continuity to organizations like yours, enabled by our product and service centres of expertise. 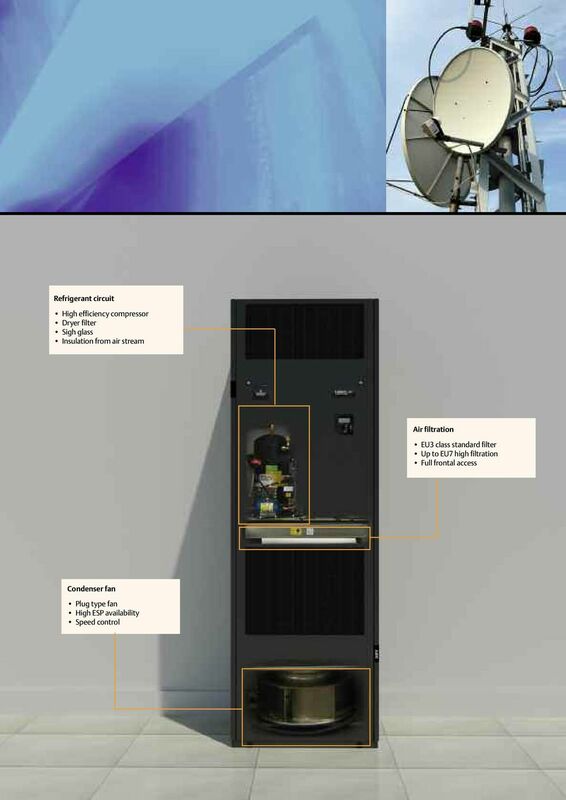 Telecom sites / Technological environments For wireless telecom applications, we provide control of remote access node environmental conditions. Our product portfolio includes a wide range of configurable solutions; outdoor packaged wall-mounting cooling system for shelters, when there s not enough space available inside the site; indoor packaged floor standing cooling system, to remotely reject, the heat generated by electronic equipment from IT rooms inside buildings; split system, to adapt the cooling solution to whatever site position, dimension and layout. 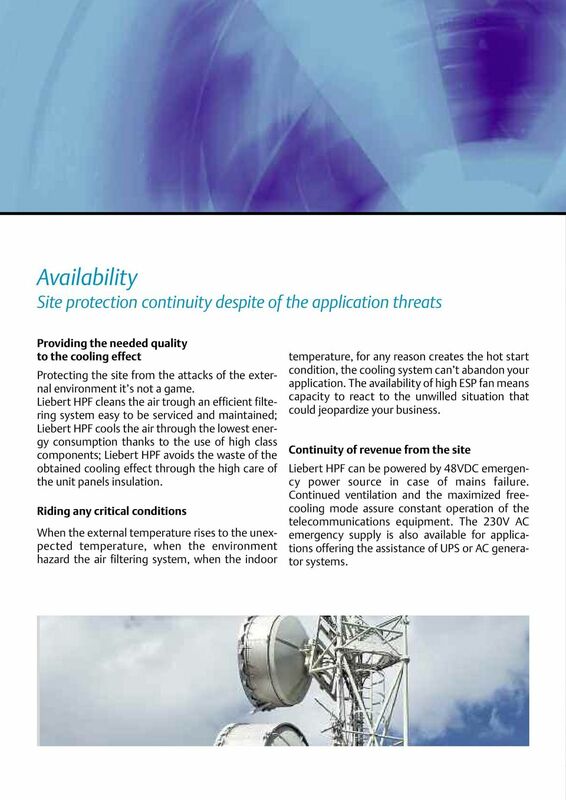 4 Availability Site protection continuity despite of the application threats Providing the needed quality to the cooling effect Protecting the site from the attacks of the external environment it s not a game. Liebert HPF cleans the air trough an efficient filtering system easy to be serviced and maintained; Liebert HPF cools the air through the lowest energy consumption thanks to the use of high class components; Liebert HPF avoids the waste of the obtained cooling effect through the high care of the unit panels insulation. Riding any critical conditions When the external temperature rises to the unexpected temperature, when the environment hazard the air filtering system, when the indoor temperature, for any reason creates the hot start condition, the cooling system can t abandon your application. The availability of high ESP fan means capacity to react to the unwilled situation that could jeopardize your business. Continuity of revenue from the site Liebert HPF can be powered by 48VDC emergency power source in case of mains failure. Continued ventilation and the maximized freecooling mode assure constant operation of the telecommunications equipment. The 230V AC emergency supply is also available for applications offering the assistance of UPS or AC generator systems. 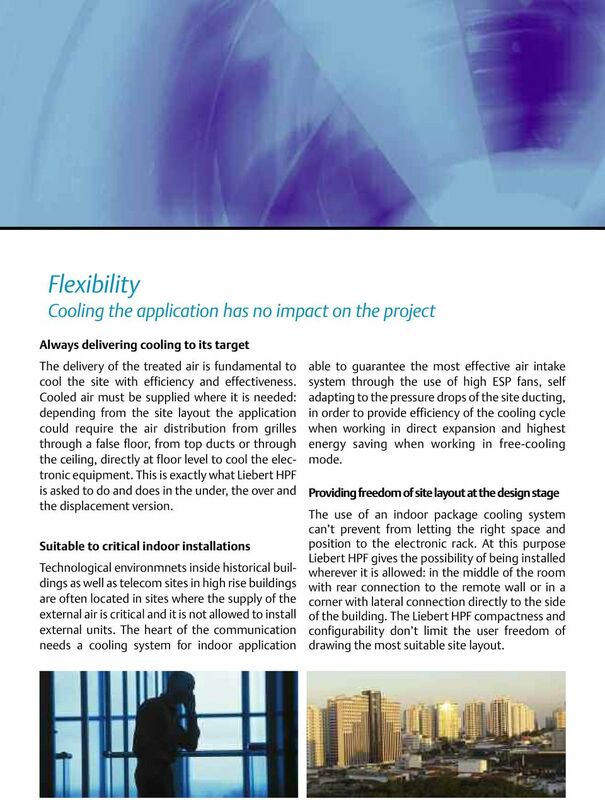 6 Flexibility Cooling the application has no impact on the project Always delivering cooling to its target The delivery of the treated air is fundamental to cool the site with efficiency and effectiveness. Cooled air must be supplied where it is needed: depending from the site layout the application could require the air distribution from grilles through a false floor, from top ducts or through the ceiling, directly at floor level to cool the electronic equipment. This is exactly what Liebert HPF is asked to do and does in the under, the over and the displacement version. 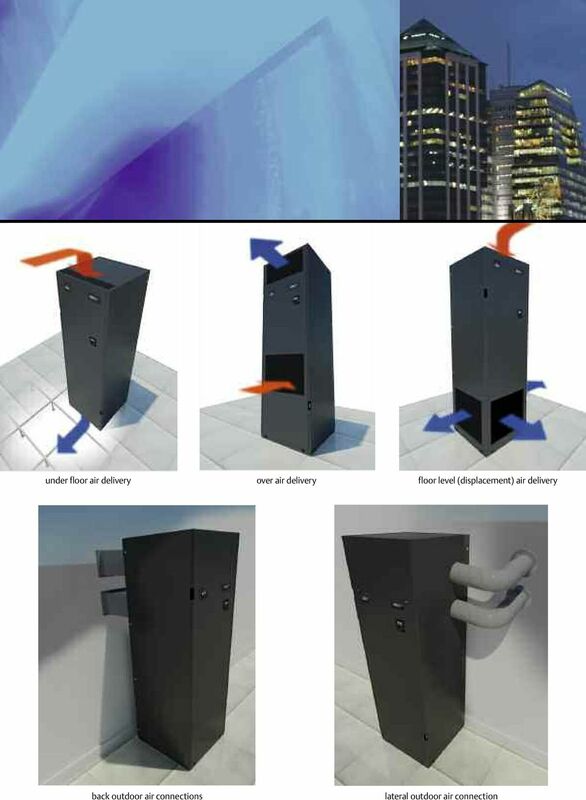 Suitable to critical indoor installations Technological environmnets inside historical buildings as well as telecom sites in high rise buildings are often located in sites where the supply of the external air is critical and it is not allowed to install external units. The heart of the communication needs a cooling system for indoor application able to guarantee the most effective air intake system through the use of high ESP fans, self adapting to the pressure drops of the site ducting, in order to provide efficiency of the cooling cycle when working in direct expansion and highest energy saving when working in free-cooling mode. Providing freedom of site layout at the design stage The use of an indoor package cooling system can t prevent from letting the right space and position to the electronic rack. At this purpose Liebert HPF gives the possibility of being installed wherever it is allowed: in the middle of the room with rear connection to the remote wall or in a corner with lateral connection directly to the side of the building. The Liebert HPF compactness and configurability don t limit the user freedom of drawing the most suitable site layout. 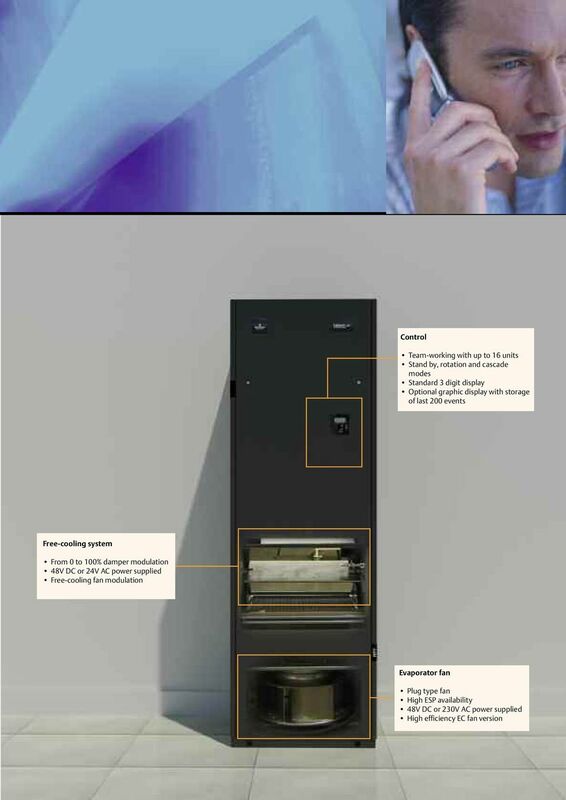 8 Total Cost of Ownership Attention to costs and care of the environment Easy of installation and fast start up The cooling circuit is pre-charged, fine tuned and fully tested before the delivery. No pressure test is required on site. Installation is furthermore speeded up by using the fast plug electrical connections (on request) and the automatic commissioning software: installation and commissioning are completed in less than 25 mins. without need of specialized personnel on site. 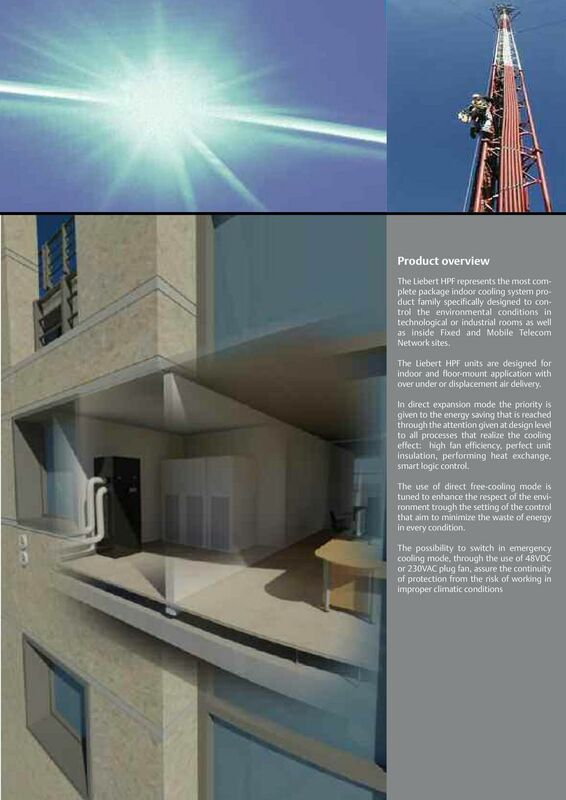 Generating high energy saving with cooling lifetime extension A close control cooling system is required to work 24 hours a day, 365 days a year: the must is to minimize the demand of energy supply in order to be cheaper to run and to prevent the impact on climate change. 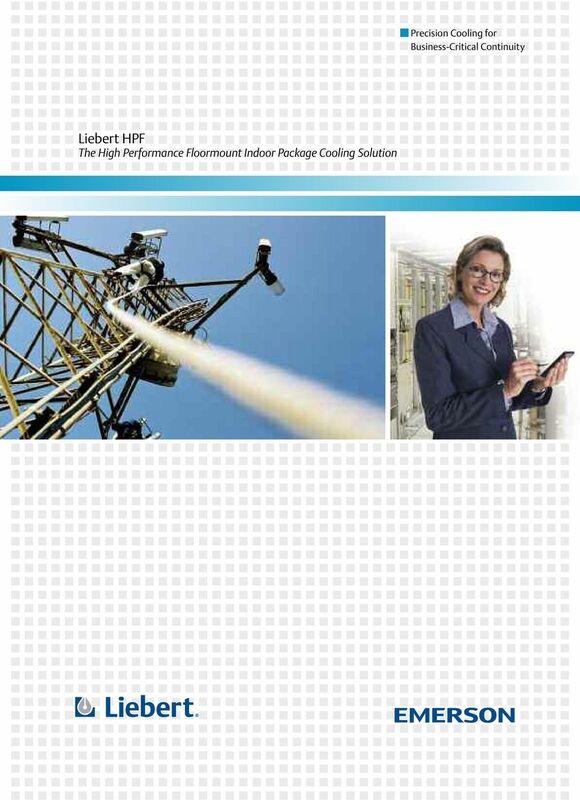 Liebert HPF aims to maximize the energy saving without compromising its effectiveness. The EC fan version reduces by 30% the energy consumption of the evaporating fan, compared to the traditional AC fan motors. 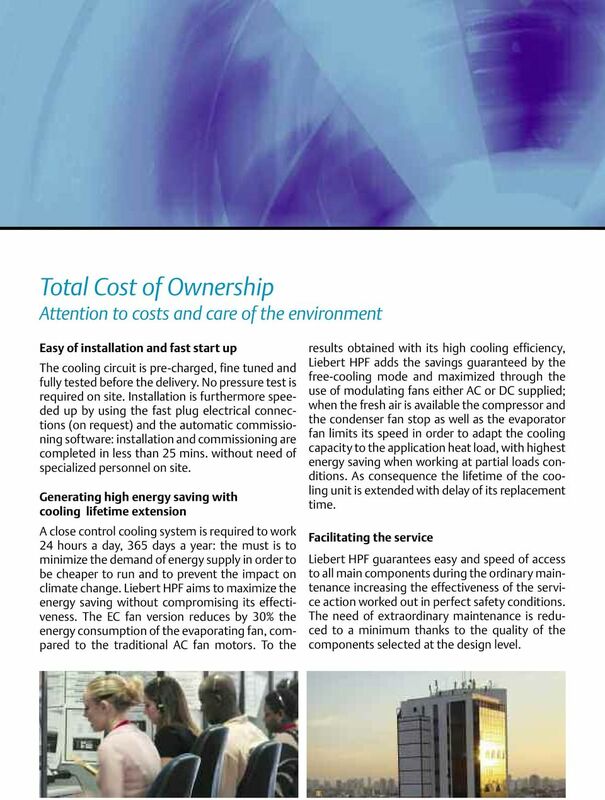 To the results obtained with its high cooling efficiency, Liebert HPF adds the savings guaranteed by the free-cooling mode and maximized through the use of modulating fans either AC or DC supplied; when the fresh air is available the compressor and the condenser fan stop as well as the evaporator fan limits its speed in order to adapt the cooling capacity to the application heat load, with highest energy saving when working at partial loads conditions. As consequence the lifetime of the cooling unit is extended with delay of its replacement time. Facilitating the service Liebert HPF guarantees easy and speed of access to all main components during the ordinary maintenance increasing the effectiveness of the service action worked out in perfect safety conditions. The need of extraordinary maintenance is reduced to a minimum thanks to the quality of the components selected at the design level. 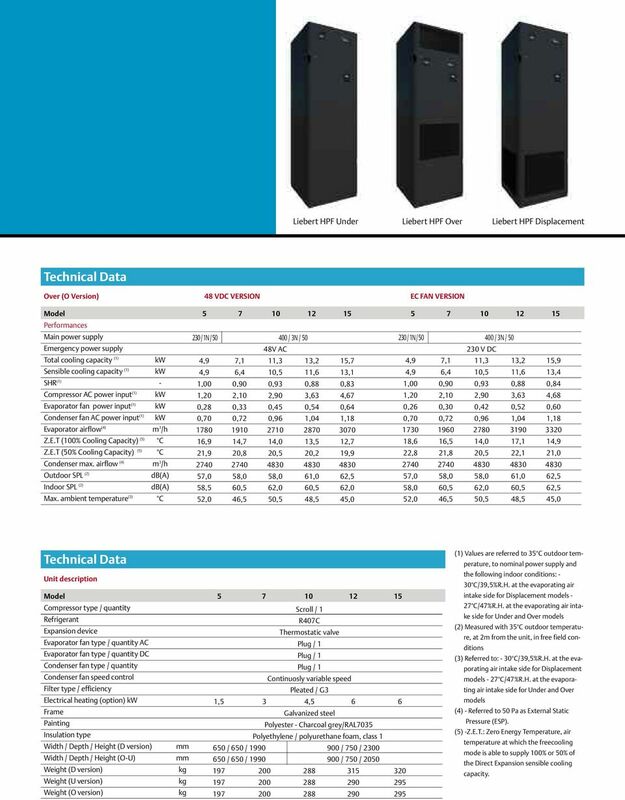 11 Liebert HPF Under Liebert HPF Over Liebert HPF Displacement Technical Data Over (O Version) 48 VDC VERSION EC FAN VERSION Model Performances Main power supply Emergency power supply 230 / 1N / / 3N / 50 48V AC 230 / 1N / / 3N / V DC Total cooling capacity (1) kw 4,9 7,1 11,3 13,2 15,7 4,9 7,1 11,3 13,2 15,9 Sensible cooling capacity (1) kw 4,9 6,4 10,5 11,6 13,1 4,9 6,4 10,5 11,6 13,4 SHR (1) - 1,00 0,90 0,93 0,88 0,83 1,00 0,90 0,93 0,88 0,84 Compressor AC power input (1) kw 1,20 2,10 2,90 3,63 4,67 1,20 2,10 2,90 3,63 4,68 Evaporator fan power input (1) kw 0,28 0,33 0,45 0,54 0,64 0,26 0,30 0,42 0,52 0,60 Condenser fan AC power input (1) kw 0,70 0,72 0,96 1,04 1,18 0,70 0,72 0,96 1,04 1,18 Evaporator airflow (4) m 3 /h Z.E.T (100% Cooling Capacity) (5) C 16,9 14,7 14,0 13,5 12,7 18,6 16,5 14,0 17,1 14,9 Z.E.T (50% Cooling Capacity) (5) C 21,9 20,8 20,5 20,2 19,9 22,8 21,8 20,5 22,1 21,0 Condenser max. airflow (4) m 3 /h Outdoor SPL (2) db(a) 57,0 58,0 58,0 61,0 62,5 57,0 58,0 58,0 61,0 62,5 Indoor SPL (2) db(a) 58,5 60,5 62,0 60,5 62,0 58,0 60,5 62,0 60,5 62,5 Max. ambient temperature (3) C 52,0 46,5 50,5 48,5 45,0 52,0 46,5 50,5 48,5 45,0 Technical Data Unit description Model Compressor type / quantity Refrigerant Expansion device Evaporator fan type / quantity AC Evaporator fan type / quantity DC Condenser fan type / quantity Scroll / 1 R407C Thermostatic valve Plug / 1 Plug / 1 Plug / 1 Condenser fan speed control Filter type / efficiency Continuosly variable speed Pleated / G3 Electrical heating (option) kw Frame 1,5 3 4,5 Galvanized steel 6 6 Painting Insulation type Polyester - Charcoal grey/ral7035 Polyethylene / polyurethane foam, class 1 Width / Depth / Height (D version) mm 650 / 650 / / 750 / 2300 Width / Depth / Height (O-U) mm 650 / 650 / / 750 / 2050 Weight (D version) kg Weight (U version) kg Weight (O version) kg (1) Values are referred to 35 C outdoor temperature, to nominal power supply and the following indoor conditions: - 30 C/39,5%R.H. at the evaporating air intake side for Displacement models - 27 C/47%R.H. 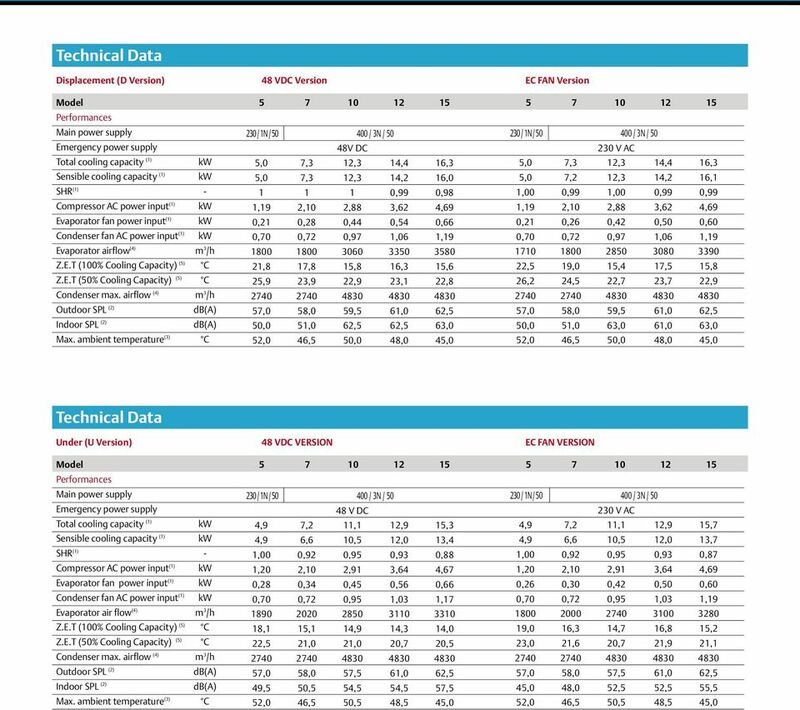 at the evaporating air intake side for Under and Over models (2) Measured with 35 C outdoor temperature, at 2m from the unit, in free field conditions (3) Referred to: - 30 C/39,5%R.H. at the evaporating air intake side for Displacement models - 27 C/47%R.H. at the evaporating air intake side for Under and Over models (4) - Referred to 50 Pa as External Static Pressure (ESP). (5) -Z.E.T. : Zero Energy Temperature, air temperature at which the freecooling mode is able to supply 100% or 50% of the Direct Expansion sensible cooling capacity. 12 Emerson Network Power, a business of Emerson (NYSE:EMR), is the global leader in enabling Business-Critical Continuity. The company is the trusted source for custom, adaptive and ultra-reliable solutions that enable and protect its customers business-critical technology infrastructures. 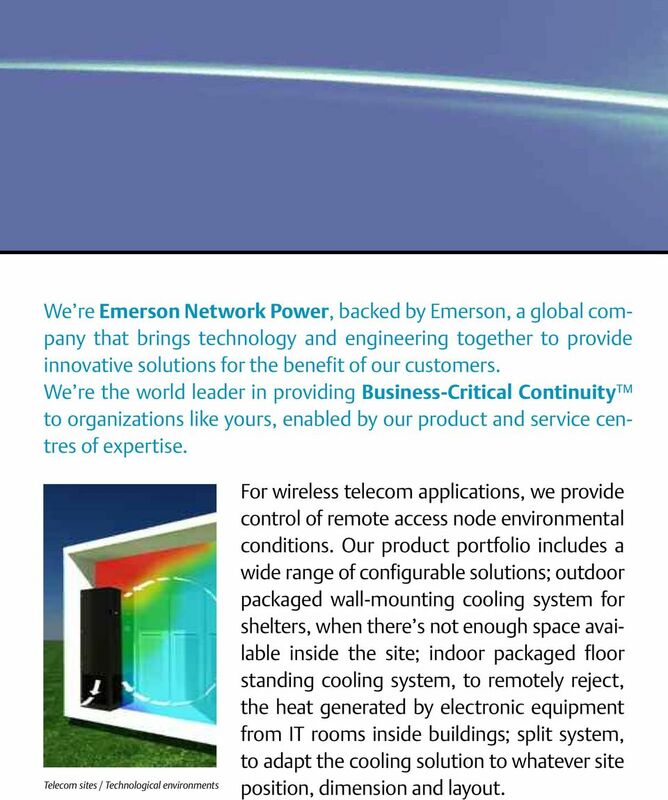 Backed by the largest global services organization in the industry, Emerson Network Power offers a full range of innovative power, precision cooling, connectivity and embedded products and services for computer, communications, healthcare and industrial systems. Key product brands within the Emerson Network Power family include Liebert, Knuerr, ASCO, Astec, Lorain. Emerson Network Power Srl Liebert Business EMEA Headquarters Via Leonardo da Vinci 16/ Piove di Sacco (PD) - Italy tel fax Liebert Corporation 1050 Dearborn Drive P.O. Box Columbus, Ohio Phone (U.S. & Canada Only) Phone (Outside U.S.) FAX Emerson Network Power Asia Pacific 7/F., Dah Sing Financial Centre 108 Gloucester Rd, Wanchai Hong Kong Phone FAX Emerson Network Power. The global leader in enabling business-critical continuity TM. 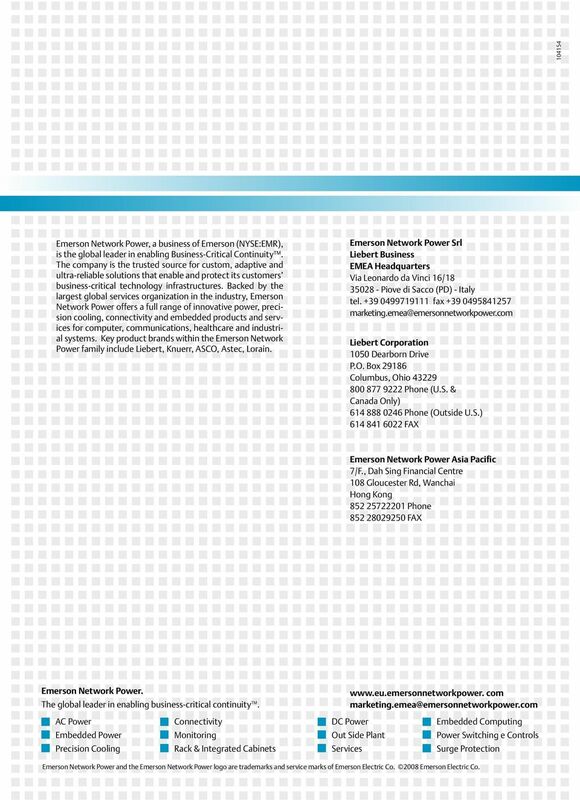 com AC Power Connectivity DC Power Embedded Computing Embedded Power Monitoring Out Side Plant Power Switching e Controls Precision Cooling Rack & Integrated Cabinets Services Surge Protection Emerson Network Power and the Emerson Network Power logo are trademarks and service marks of Emerson Electric Co Emerson Electric Co.